The 2-3 (or 2-1-2) zone defense is the most commonly used zone defense, designed to stop the inside game. The 2-1-2 zone is the same as the 2-3, except that the middle low defender is positioned a little higher in the paint, so the terms can be used interchangeably. Good outside shooting can rip this zone apart. But you still need to get the ball inside, especially late in the game, or when your shooters are not hitting. First read Zone Offense. Mostly we attack zones with a general zone offense like "Zone-23" below and just work that offense. Usually that is all we need to do, as long as we execute well and are patient, make the zone shift, and work the ball inside. But at times, we will run a set zone play to get someone open for a good shot, whether an inside shot or a 3-pointer. In teaching our system, we first teach our basic zone offense(s), and then add a few plays as the season progresses (see 2-3 Zone Plays). But first, if you are coaching young players, consider this simple 2-3 zone offense... easy to understand and teach. 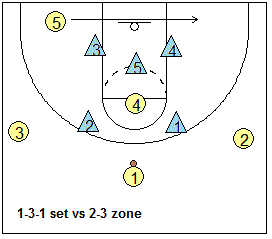 Rules - this zone offense uses a 1-3-1 offensive set. 1. O5 will run the baseline from short corner to short corner and we will try to pass the ball to O5 from the wing (O2 or O3), usually after reversing the ball once. We do not want O5 to post up on the low block, as this spot is too well-defended by the three low zone defenders... a pass here is usually double-teamed and results in a turnover. Additionally, if the ball is passed into the high post O4, O5 should try to "duck" underneath the zone, seal the defender, and receive the quick pass from O4 for the lay-up (diagram A). 2. In diagram A, the wings O2 and O3 are set out a little farther than usual from the three-point arc so that the X1 and X2 defenders are not in their passing lane (from O1). After receiving the pass, O2 or O3 can dribble in, get the defender to commit and then pass or shoot. If the ball goes into the short corner, O2 and O3 should both slide down to the corners. Good skip passes between O2 and O3 catch the zone over-shifted (diagram B), but make sure the skip pass is open... some teams will aggressively try to steal this pass (with the weak-side low defender cheating out). 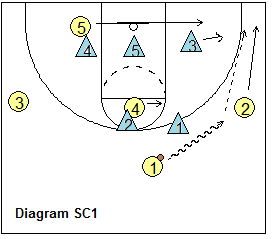 A counter for that is a fake skip to the wing, and then a lob pass to O5 on the weakside block. 3. O4 moves with the ball. When the ball is at the point, O4 is at the free-throw line. When the ball is on the wing, instead of posting at the elbow or at the low block (which are usually defended in this zone), O4 will set up a little lower than the elbow, actually in the gap between the high and low defenders (diagram B). We don't like O4 putting the ball on the floor with a dribble as this usually invites trouble from collapsing defenders. O4 should receive the ball, pivot and face the hoop and either shoot or pass without holding the ball too long... a quick decision is needed. When the ball is in the short corner (O5), O4 cuts to the ball-side low block for the pass from O5 and the power lay-up (diagram C). 4. You can get the ball to O5 by a pass from O2 or O3, or occasionally from O4. Oftentimes, it is easier to make the wing-to-O5 pass after reversing the ball once from side to side, as this causes the zone to shift (e.g. O1 passes to O3, O3 skip passes to O2 and O2 then passes to O5). O5 may be able to make a quick inside pass to O4 cutting for the lay-up (once the X4 defender commits to guarding O5). Another option for O5 is to pass to O3 in the opposite corner. Additionally, when O5 gets the ball in the short corner, O2 can slide further down into the ball-side corner and usually will be wide open for a 3-point shot if O5 passes back out (because the X1 defender will usually not drop all the way down to the corner). 5. The weak-side wing always cuts to the corner when O5 gets the ball (Diagram B). When O4 has the ball (Diagram C), the weak-side wing can either slide into the gap between the high and low defenders looking for the medium range jumper, or if he/she is a good three-point shooter, look for the skip pass out to the three-point arc. The weak-side wing must be an offensive rebounder on the back-side. 6. Outside shooters have a tendency to let the first open shot go. So that we continue to try to get the ball inside, we have a rule... "one post-touch". Before taking an outside shot, the ball has to go inside to O4 or O5 for at least one touch. The exception to this rule is outside shooters can shoot in transition, off the break, if there is a "kick-out" pass for the 3-point shot. But if the shot off the break is not there and we set up in our zone offense, then the "post-touch" rule applies. Looking at Diagram C, you can see that once O4 gets the ball, there are several offensive "triangles", or passing options where you gain a 3 against 2 advantage on the defense. Quick passing will get you a good shot. The diagrams below show a great way to use the short corner. Diagram SC1 shows O1 dribbling to the right wing, engaging X1, and O2 moves down to the corner. O1 passes to O2, which causes the low outside defender X3 to come out and guard O2. O2 takes a couple dribbles up (diagram SC2) and this "lifts" the X3 defender, making O5 open for the pass in the short corner. O2 passes to O5 (diagram SC3). O4 dives to the ballside block. If X5 comes out to defend O5, O5 passes to O4 for the lay-up. 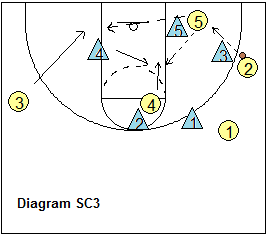 If X5 stays inside, O5 has the short corner jump-shot, or a drive to the hoop. With this attack, we are pressuring X5 to defend two players. If X4 helps on O4's dive cut, O3 reads this and cuts to the weakside block for a pass from O5. 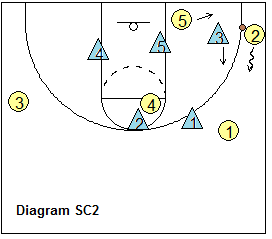 This set uses the same general principles and rules as "Zone-23" above, but gives your offense a little different "look". Instead of starting with a high post, the attack comes from underneath the zone, from the opposite low post. This means that we must start with a wing entry. Refer to the diagrams below. The offense is started by O1 passing to the wing (Diagram A). If the wing pass is being denied, O1 dribbles to the wing, with O2 making a shallow cut out to the point (Diagram B). As the ball arrives on the wing, the ball-side low post (O4) cuts to the short corner yelling "ball, ball, ball! ", in hopes of drawing the low post defender out with him. The wing passes to either O5 along the lane or O4 in the short corner (Diagram C). O5 has the option of shooting, driving to the hoop (if the X5 defender has moved out), or passing to either O4 or reversing it to O3 (who should be wide open on the opposite side). If the pass from the wing goes to the short corner (O4), then O5 cuts to the low block looking for the pass from O4. Note that O2 and O1 have slid down a little toward the corner in case O4 must pass back out. Diagram F. Again using the 3-out, 2-in set, O1 makes the pass to the wing, and this triggers the ball-side post player (O4) to flash to the gap near the ball-side elbow. After receiving the pass, O4 pivots and looks inside or makes a shot fake, and passes to O5 who maneuvers inside the opposite post defender for the pass and shot. Skip Pass and Weakside Attack. Here is another way of attacking using either the 1-3-1 or the 3-out, 2-in set, especially if O4 is being denied and fronted. See diagram H. You'll note that the 2-3 zone defense has shifted when the ball is on the right wing. Many teams defend the skip pass by having the opposite low post (X3) rotate out to the wing. X3 will then drop back down once the outside defenders catch-up in their rotation. You can take advantage of that strategy by keeping your low post on the weak-side (instead of moving to the ball-side short corner). Then make the skip pass to O3, and as X3 rotates out, make the quick pass inside to O5. O4 screens the middle (X5) defender so that he cannot rotate in time to defend O5. For the complete article, including "Zone-I" and "Zone-23" in the 1-4 set , become a Premium Member, or get the Playbook download.